My dad is of Lebanese heritage, and since I was a little girl, I’ve always been fascinated by belly dancers. The costumes! The finer cymbals! The glittery, shimmery jewels that accentuate the way they move. I’ve even taken belly dancing classes at different times throughout my life. I’ve never gotten very good at it, but it’s still super fun. Turns out, the Western form of belly dancing that most of us have seen – with gauzy costumes and jangling jewelry – is based on the Ghawazi dancers of Egypt. The Arabic word “ghawazi” means “conqueror,” a reference to the way the dancer conquered the heart of her audience. It makes me wonder: If the way to a man’s heart is through the stomach, doesn’t Belly Dance Beet Salad double our heart-winning powers? This salad is exotic, but not fussy or too challenging. The flavors make sense but are also magically unexpected. I like to eat it at room temperature, but you can dance with it the way you like. Preheat the oven to 375F. Cover two large baking sheets with parchment paper. Wash the beets, and cut off the stem and root ends – no need to peel them! Cut the beets in half and toss with melted coconut oil. Roast for about 45-60 minutes, until tender. To toast the pistachios, spread them in a single layer on the other baking sheet and add to the oven during the last 7-10 minutes of roasting the beets. Allow them to cool, then coarsely chop them. When the beets are done, allow them to cool enough to handle and cut into 1/2-inch cubes. (PRO TIP: Use the parchment paper from the baking sheet on top of your cutting board for easier cleanup.) Place the beets in a large bowl and toss with the dressing. Add the scallions and pistachios and toss well with two wooden spoons. Allow to cool to room temperature before eating. Taste and add more salt and pepper, if necessary. Wash the beet tops thoroughly to remove grit, then chop and throw in a pan with a little water and steam ’til tender. Toss with ghee or coconut oil, salt, pepper, and a clove of crushed garlic. Eat as a bed of awesomeness under the room temperature beet salad! Just found your blog …LOVE IT and luv the beet salad … yummmmm …!!! good stuff all over your blog 🙂 … and I read about your hypothyroid situation – I have fought that one for the past 10 years (synthyroid 150mcg and Cytomel 25mcg x 2-3) – you will figure out what works best for you, but sounds like you are already on that road !! Hi, Elizabeth! Glad you like the blog! Yes, thyroid is a total pain, but it seems to be getting sorted out. I'm on 112mdg right now, but might go a little higher still — next check-in with endo is in August. Do you slice the beets before or after you roast them? I recommend roasting the beets either whole or just cut in half so they don't get too dry… then slice them after you're finished roasting. That beet salad was GENIUS. We are STILL talking about it. Yum. And yum again. Boy, I've made this for two parties and twice just for myself. I absolutely love it! Thank-you! Hey, Anonymous… so glad you like it. Thanks for letting me know! Karyn–> How fun that your husband whipped this up while you were working out. WIN! Glad you liked it! I saw that homemade gyro recipe, too… definitely want to try that one! I finally got around to making this beet dish. WHAT TOOK ME SO LONG? God. It was amazing. Thank you for the recipe! And now I’m thinking, “Why haven’t I made this since last year?” Back to the kitchen with me! I found your site about two weeks ago, have been gradually working my way through a bunch of the recipes. So many are so delicious! thank you! I sauteed the beet greens w/ a slice of ham and a little bit of onion (left over from making the salad), then threw the cover on the pan after putting two eggs in to poach. put all of that on a plate (which probably would have still been good on it’s own, but awfully similar to what I eat most mornings) and then topped it with some of the beet salad (and a definite drizzle of the dressing!). SO GOOD. thank you for the inspiration and reminding me to use the greens! Hooray! I’m glad you made magic with the beet tops. I had some this week, too, and they are SO good. I love your breakfast — it sounds super yummy and packed with power food. Thanks so much for sharing. I’m glad you’re enjoying the recipes. Just fixed this tonight! Excellent. Glad you liked it. The real question is: did it make you want to belly dance?! White wine, champagne, cider, and rice vinegar should all work just fine. Hope you like it! Amazing…even my 2 and 4 year old were begging for seconds. WONDERFUL! Only changes were that I caramelized the onions because we didn’t have spring sweet onions, and used cider vinegar (thanks for the suggestion) because I was out of red wine. mmmmm….good! Thanks again for ANOTHER delicious meal! This is the first preparation of beets I’ve ever liked! I sliced the beets about 1/2 inch thick and grilled them, otherwise I followed the recipe exactly. The orange and pistachio perfectly compliment the grilled beets. Thanks for the recipe! This is sooo good. Made it exactly like the recipe the first time except used pecans. This time I’m doubling it. YUMMY! This is really good! But the volume of dressing seems excessive and I misread the directions only using 1/4 cup oil . Instead of 28 oz of beets I have 24 oz not sure that would make a big difference, though. Oh we’ll, I will save the extra dressing for salad, it’s yummy! This has been my go to potluck salad for a while now! I up the spices and add in some sweet potatoes, roasted garlic and thai red chilli paste. Last week I added slices of blood orange. Question: do you roast beets if using canned? Just stumbled onto this and a few other older recipes – looks so tasty. No need to roast if using canned — just skip to the step where you toss with dressing. What a great salad, so simple, yet so delicious. Can’t wait to have it again! I don’t have any pistachios. I do have walnuts, hazelnuts,pine nuts, almonds & pecans. Which would you recommend? As a side note, a few months ago I went paleo. I just started my first whole30 a couple days ago. I have been making good use of your well fed cookbook! It’s definitely my favourite, I’ve been toting it around to cook for other (non paleo) people & we have all been enjoying your recipes!! Hazelnuts or pine nuts would be the best; walnuts would be third choice. Congrats on Whole30-ing! Hope you feel great! I went with the pine nuts, added in the cumin & chopped the beets into chunks. I opted for apple cider vinegar (I didn’t have the red wine vinegar). Served it on a bed of sautéed beet greens with fresh local sausage on the side. Sooooo delicious! My husband (who’s not a fan of beets) and my 2 year old enjoyed it as well. So Google is starting to recognize this in their type ahead feature when you enter belly dance beet… pretty cool, and my new favorite thing to eat. Glad you like this one — yay, purple fingertips! I made these last night. I used 1/4 cup of oil and it was great. Also cooked up the greens. Didn’t have nuts so just left them out. Also used a mix of yellow and red beets. I like the taste of the red better, but the yellow are not as messy. My husband loves all the veggies that we are eating on the Whole 30. And I love that you have so many great recipes to make it easy as well as delicious! I bet the yello + red combo looked really pretty! Ya, they looked pretty the first night, but when I had them for breakfast (still yum!) the red kind of dyed them. Bought both of your books today. Really looking forward to making more delicious meals. Made it with golden beets….so good! Next time I’d do golden AND red for extra color. Awesome recipe!!!! Thank you! I just got four huge beets in my CSA share and I don’t ever cook them….will try this recipe, sounds delish. left for tomorrow’s dinner. YUMMY!!!! Received beets in my CSA this weekend. 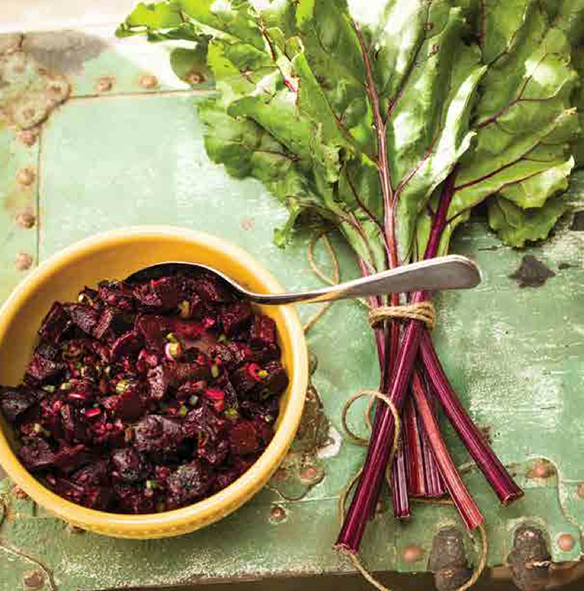 Searched your site for a beet recipe and found this Belly Dance Beet Salad. It was a hit! I have both of your cookbooks and I use your site for a recipe resource all of the time. Just wanted to say thank you for all that you do to make eating healthy easier. Is the Orange a necessary fruit here? Or can you use a lemon, lime, or other citrus fruit? Thanks! I just made this last night and holy cow, what a fantastic salad!!! I loved everything about it, thank you so much for sharing the recipe!! This will taste fresh in the fridge for 2-3 days, but it really tastes best on days 1 and 2. After that, the flavors get a little dull.